Pull up a chair, pour a drink and shelve all other tasks for a couple of hours. This will get you set to dive headfirst into the poetic world of Cameron Blake where the music plays second fiddle to the words and long term applicants only need apply. If you instantly reject this record then it’s best to stay away, however if you hang in there, tune into the mono sonic vibes and grapple with the lyrical content, rich pickings are to be found. 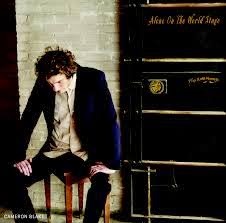 ALONE ON THE WORLD STAGE is a title which perfectly sums up Cameron’s approach to his art and his craving to take a very individualistic approach to the storytelling song genre. Grand Rapids, Michigan is the home of the now settled family man and he uses this base to span his writing from the intensely personal, politically regional to wider global issues. Alternative perspectives are a key driver for Cameron’s writing and a vital accompaniment for coming to grips with his literary messages was an informed song analysis piece on his website. Perhaps reading this before tackling the music is the way forward as elements of intrigue certainly leap from your screen as you gather this information. Once feeling informed about the implicit, explicit and abstract, the puzzle begins to emerge from its fragmented pieces. Cameron, in the tradition of the protest genre, has numerous key issues in his sights as he tackles the Israeli-Palestinian conflict in ‘Rise and Shine’, and more closer to home causes in ‘North Dakota Oil’ and ‘Detroit’. The first and last of this trio are the closest he gets to surpassing the message with musical effect with the former labelled with chorus intent. The two home causes reflect Cameron’s alternative lyrical approach as ‘Detroit’ is focussed on recession victims, while the state of North Dakota gets personified in its critique. Also on Cameron’s social justice mission are the issues raised in ‘Welfare Street’ such as disabled workers and dishonest politicians. Dedication to his unborn daughter in ‘Ultrasound’ shows the tender side of Cameron’s work which is equally as creative in taking obscure external observations and moulding them into songs. This has proved the evolution process of the curious ‘Home Movie’, ‘Fireman Snowman’ and ‘Wild Blue Garden’, all quite vivid accounts once understood. However like all twelve tracks that form this album, it is a case of one man versus his subject armed only with a guitar, occasional piano and a bunch of words. This is a format long the staple of the solo folk protest singer-songwriter and Cameron slips extremely comfortable into this role. ALONE ON THE WORLD STAGE is a lyrical beast which gains in momentum with each listen, providing the circumstances and mood are right. 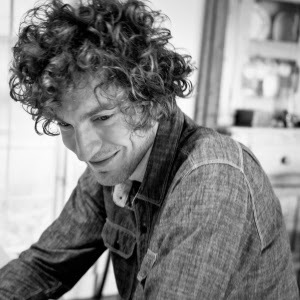 Experience of other mono driven song writers such as Nick Drake, Bob Dylan and Leonard Cohen will help with understanding Cameron Blake, and accessing his inner thoughts via the songs on this album reveal an artist with masses of interesting ideas and perceptions to share. Perseverance is the key to unlock this piece of work and enjoy its treasures.